The First Continental Congress was a convention of delegates from twelve colonies (Georgia was not present) that met on September 5, 1774, at Carpenters’ Hall in Philadelphia, Pennsylvania, early in the American Revolution. It was called in response to the passage of the Coercive Acts (also known as Intolerable Acts by the Colonial Americans) by the British Parliament. The Intolerable Acts had punished Boston for the Boston Tea Party. The Congress was attended by 56 members appointed by the legislatures of twelve of the Thirteen Colonies, the exception being the Province of Georgia, which was hoping for British assistance with Indian problems on its frontier. The Congress met briefly to consider options, including an economic boycott of British trade; rights and grievances; and petitioned King George III for redress of those grievances. The Congress also called for another Continental Congress in the event that their petition was unsuccessful in halting enforcement of the Intolerable Acts. Their appeal to the Crown had no effect, and so the Second Continental Congress was convened the following year to organize the defense of the colonies at the onset of the American Revolutionary War. The delegates also urged each colony to set up and train its own militia. The Congress met from September 5 to October 26, 1774 Peyton Randolph presided over the proceedings; Henry Middleton took over as President of the Congress for the last few days, from October 22 to October 26. Charles Thomson, leader of Philadelphia Committee of Correspondence, was selected to be Secretary of the Continental Congress. Patrick Henry argued that the presence of the British fleet and army in America showed that the colonial governments, as they had been established, had been dissolved, and that the American colonies were in a “state of nature,” and so argued for the establishment of a new independent government. Pennsylvania delegate Joseph Galloway sought reconciliation with Britain. He put forth a “Plan of Union”, which suggested an American legislative body be formed, with some authority, and whose consent would be required for imperial measures. John Jay, Edward Rutledge, and other conservatives supported Galloway’s plan. Galloway would later join the Loyalists. The Congress had two primary accomplishments. The first was a compact among the colonies to boycott British goods beginning on December 1, 1774. The West Indies were threatened with a boycott unless the islands agreed to nonimportation of British goods. Imports from Britain dropped by 97 percent in 1775, compared with the previous year. Committees of observation and inspection were to be formed in each colony for enforcement of the Association. All of the colonial Houses of Assembly approved the proceedings of the congress with the exception of New York and Georgia. If the “Intolerable Acts” were not repealed, the colonies would also cease exports to Britain after September 10, 1775. The boycott was successfully implemented, but its potential for altering British colonial policy was cut off by the outbreak of the American Revolutionary War. The colonists were forced to quarter British soldiers, and feed them. 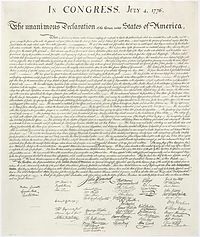 The second accomplishment of the Congress was to provide for a Second Continental Congress to meet on May 10, 1775. In addition to the colonies which had sent delegates to the First Continental Congress, the Congress resolved on October 21, 1774 to send letters of invitation to Quebec, Saint John’s Island (now Prince Edward Island), Nova Scotia, Georgia, East Florida, and West Florida. However, letters appear to have been sent only to Quebec (three letters in all). None of these other colonies sent delegates to the opening of the second Congress, though a delegation from Georgia arrived the following July.